604-826-1199 For inquiries or bookings, we are always here to take your call What's New? 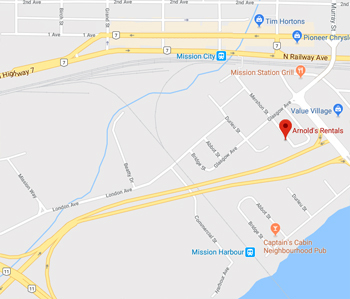 Arnold's Rentals is located in Mission BC. We've been providing tool & equipment rentals throughout the Fraser Valley to contractors, landscapers, and home owners for over 30 years. Browse our large selection of rental tools and equipment. We also sell new and used equipment. Please call with any questions or to book tools and equipment for your project. Whether it's a large boom lift to a construction site or a ladder to your home, we provide delivery and pick-up service in Mission, Abbotsford, Maple Ridge, Chilliwack and throughout the entire Fraser Valley. © Arnold's Rentals Ltd. 2018 All Rights Reserved.